Open Hearts, Open Minds, Open Doors: A community of faith striving to do good, do no harm & stay in love with God. 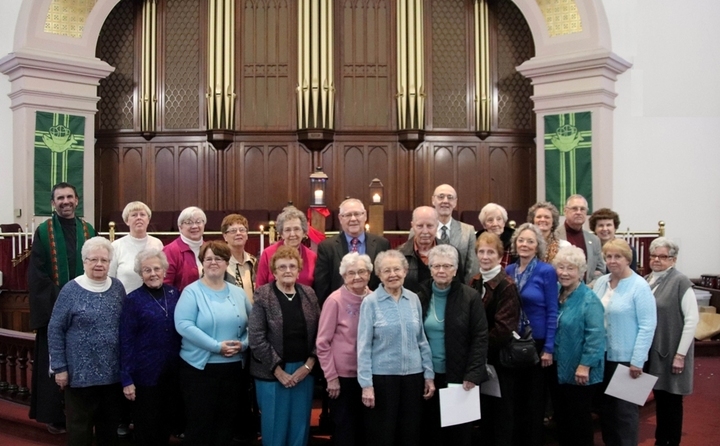 On Sunday, November 19, 2017, twenty five members of the Central United Methodist Church were recognized for their commitment as longstanding members for fifty years or more. We give thanks to God for our Methodist heritage. Front row from l to r: Joyce White, Doris Soden, Sue Knickerbocker, Lillian Piercy, Doris Day, Marjorie Dakey, Patricia Tamblyn, Carolyn Turner Mackle, Sandy Dunn, Alberta Robbins, Marilynn Jaggars and Diann Welsh. Back row from l to r: Pastor Rob Kazinski, Sue Graziadio, Kathie Feik, Sharon Herzog, Mary Varcoe, Paul Lautenschlager, Jay Branning, Mark Figura, Patricia Bonear, Ellen Avery Dunn, John Jaggars and Dottie Wilcox. Missing from the photo are Winnie Tolerico and Lorraine Branning.